I have been reading Curt Bonk's book, The World is Open, and found this list of resources to be really valuable. I was surprised to see the information about Chicago HOPES. I've met with their leaders and hosted them at Tutor/Mentor Leadership and Networking Conferences over the past decade so feel I've had some contribution to their growth. 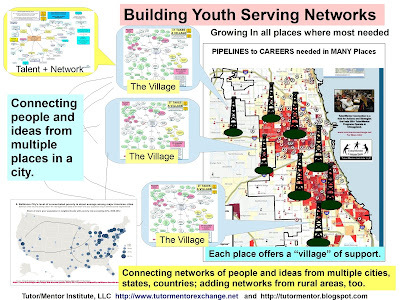 In this blog written by Nicole While, who was on staff with the Tutor/Mentor Connection between 2007 and 2011, you can find a link to a Chicago HOPES Blog that we helped them set up in 2009. Small world, isn't it. "My thought would be that we need to find ways to keep leaders in place for longer periods of time so that the knowledge of an organization can grow as well as the relationships formed between leaders in many different groups focused on the same issues. Chicago HOPES relies on National Service volunteers who change every one-to-three years and principles in public schools also change frequently. Leaders and staff in community based non profits working with youth change frequently due to lack of funding and working conditions. Thus, while there is a huge wealth of knowledge available in places like Connexions and similar on-line libraries, the accumulation of this knowledge in organizations is not consistent because of the changes in people." Volunteers, interns, high school students, etc. could take on the role of journalists for programs in different neighborhoods. Tech volunteers could help programs set up pages on their sites to host blogs, post vision statements, and post links to programs that illustrate what they are trying to do. We can connect on-line to share ideas of how we help programs grow. We can also connect in conferences such as the one I host in May and November each year in Chicago. I write about these issues on this blog and share more ideas on the Tutor/Mentor Institute, LLC site. I would be delighted to connect with any of you who are interested in sharing ideas and brainstorming "tipping points" where we could influence the retention of key people, the connections of these people, and the ways information on the Internet is being used to support understanding, thinking and strategies. I'm based in Chicago and have an office in the Highsight.org program at 315 W. Walton. 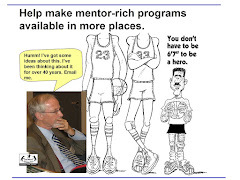 On line Mentoring Forums - Do you know any?